The basic purpose of the Blitz Mobile App was to help university students to get the most of their Learning Management System (LMS). create a student hub, which can help professional collaboration. Most of the students struggle with following up on changes in their LMS. Even though they do know that schedules might change, sometimes they forget to check the web page of their university. 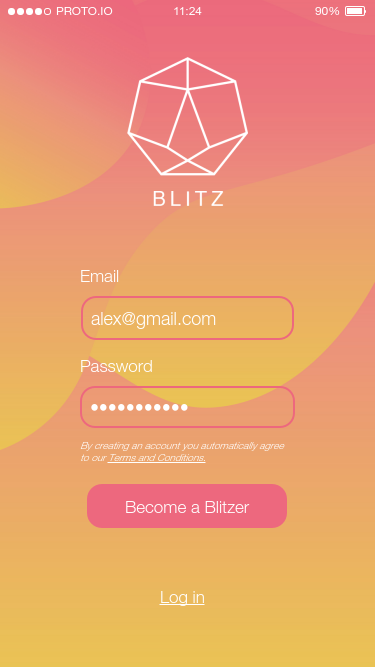 The client wanted to develop the Blitz app to make this process easier by automatically sending all necessary notifications and messages. It actions as a personal uni assistant. I based my research not that much on learning/university apps but on more entertaining and playful projects. The reason behind it is my desire to attract future users to this app. So, if they'd see a notification from Blitz, they would check it immediately as they'd have pleasure in using this app. That said, I wanted to change the mindset of certain students, who though before that studying is boring and very official. As I was given the main idea and some previous market research, I invested some of my time into the visual side of this project. The prototype was mostly created for my client to use it as a part of their pitch to future investors. The essential goals were achieved and Blitz looks as a fun little helper to make students' lives easier. It is not essential to limit your research to similar project only. The interface might be different but the usability standards can still stay suitable for a productivity app. Value your time, without spending all of it for a test project. The main goal is to bring the project's idea and functionality to the picture. The details can be reworked later.